Welcome back to Something About Coins! 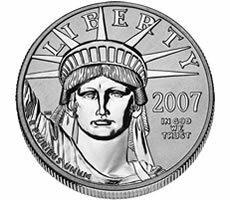 Numismatic Guaranty Corporation (NGC) reported a new 2007 platinum eagle variety. The Perth Mint of Australia is now offering their 2011 Australian Gilded Koala Silver Coin, and the Taiwan Bank is selling Year of the Rabbit commemorative three coin sets. Another report from last week's Florida United Numismatists (FUN) convention came in, and some history of the 1854-S gold dollar and 1840-S Seated silver dollar are described in the articles below.